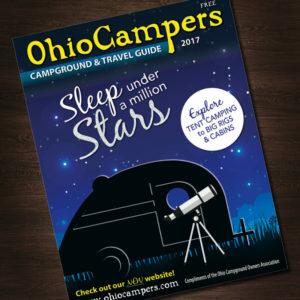 Published for the Ohio Campground Owners Association, this travel guide features advertisements and listings of over 145 private Ohio campgrounds, as well as display ads for RV Dealers, Camping Services and Ohio attractions. For more specific information, please download the rate sheet and ad order form below. Distributed throughout Ohio and beyond through member campgrounds, RV & Travel Shows, RV Dealers, 1-800-BUCKEYE, ODOT Welcome Centers, AAA’s, CVB’s, and many high traffic tourist locations. New distribution begins January 1 of each year. Advertising open to all businesses who may benefit from the Ohio camping and tourism industry. Campground advertisers must be a member of the Ohio Campground Owners Association.